Bodrodz Doug Anderson sets WGSA Top Gravity Streamliner record with Atomic Scalpel! ​ Bodrodz "FastDonnie" Schoettler sets a new WGSA world record in 2017, upping the record he set in 2016. Steve Thomas, Andy Ash, and Jono Searby were fly ins from the United Kingdom and joined the Bodrodz team at this event. Without their hard work, dedication, and teamwork of Bodrodz Xtreme Gravity Racing, "Fast Donnie's" world record would not have been possible. Bodrodz Land Luge Workz was founded by Doug Anderson of Atlanta Georgia in 1998. A long time welder and aircraft technician for Delta Air Lines, Anderson had been involved with nitro funny cars, drag hydroplanes, and numerous circle track cars with many 1st place finishes. While searching the fledgling internet for extreme sports, Anderson ran across Ed Bryant and his street luge who lived in northwest Atlanta. Bryant, a cabinet maker, was already an avid luge rider who had competed in numerous National Street Luge Association (NSLA) events and the Gravity Games. Bryant extended the invitation for Anderson to try it, and Anderson jumped at the opportunity. Al Braun, a fireman, also from the Atlanta area, had also contacted Bryant about riding, met Bryant and Anderson at a small hill south of Atlanta in the summer of 1998 for their introduction to the high speed sport. After each had bombed their first hill, it was obvious this sport was for them. Now the job at hand was to build two luges for Anderson and Braun. Anderson, being a welder fabricator, studied Bryant's pan design luge, set out refining and building his first luge. Braun would take possession and ride an early Bryant sled. With input from Bryant, Anderson would refine Bryant's pan style luge design and produce a race winning sled. This luge would remain Anderson's favorite to this day. Anderson stoked after building the first street luge so much he founded Bodrodz Land Luge Workz in late 1998. Hot rods for your body, hence the name, Bodrodz. Anderson and Bryant would collaborate on different designs and techniques to refine Bryant's pan based street luge design which Bodrodz would become known for. Their high performance designs would go on to have much success, winning races and achieving some incredible high speed runs. Anderson gives credit to Ed Bryant for being a large part of the Bodrodz Landluge Workz history. "Without Ed Bryant's involvement and input, Bodrodz would not be what it is today " says Anderson. Al Braun was involved with Bodrodz Land Luge Workz at it's inception in 1998. The three amigos would run the mountain roads in North Georgia with names like Brasstown Bald, Burnt Mountain, Wolfpen Gap, Fort Mountain, Owl Creek, and a favorite named Blood Mountain, whenever possible.. And of course, Cheaha Mountain in Alabama. Anderson and Braun would share a Bryant sled until Anderson finished his first one of many to come. Team Bodrodz was launched. In early 1999 Scott Holsenback would meet Anderson at work and soon after his first run would be building his own luge. It was obvious Scott would take the sport very seriously and would train relentlessly. His training and seat time would pay off big time. Holsenback would make EDI's pro ranking quickly after winning or placing in every amateur race he entered. Scott would prove he was going to be a top competitor by placing 4th his rookie year at the Gravity Games in Providence RI in 2000. The Bodrodz team would race at events across the country. In 2003, the Bodrodz team would slowly dismantle. Teammates had obligations and priorities that took precedence. However, Bodrodz Xtreme Gravity Racing had made it's mark in street luge history as on of the Southeast's premier street luge teams. Anderson and Bryant's paths would cross once again in 2010. Talk of the West Coast gravity car scene came up and the two were back at it again, designing and building two Bodrodz gravity cars. This time the machines would have brake pedals and a steering wheels, both now in their 50's, this made a lot more sense. Over the next few years, the two had no idea they would be reaching speeds in the mid 80's. Both speed junkies, this was much to their liking. Anderson's car, the Atomic Splinter would be the first Bodrodz gravity car to break the 80 mph barrier. Bryant, piloting the Bodrodz Bullet, would do the same not much later. Late 2012 saw a new Bodrodz member, Jason Camp would come on board. Jason played an indispensable roll in keeping Anderson and Bryant rolling. Anderson would race in three East Coast Challenges with a good showing in 2013. In 2014, Anderson and Bryant would enter the Bodrodz Ultimate GPS Speed Challenge. Anderson would win with the top speed of the event followed by Bryant and Schoettler. In the fall of 2014, because of differences, Ed Bryant would depart from BXGR. Anderson and Camp would now carry the torch for Bodrodz. Anderson would have good friend, Danny Bern of the S.U.C.K.E.R. group out of Southern California, drive the Atomic Splinter in the 2014 ECC. Because of poor roll off starts, both cars made dismal showings. As of 2015, Anderson and Camp were still running the mountain roads looking for the elusive MPH. Great news, in the summer of 2015, Scott "Scootball" Holsenback is back! He would rejoin the Bodrodz team and would help Anderson and Camp with the new Bodrodz gravity project. Holsenback would take up residence in the cockpit of the Bodrodz Bullet. Bodrodz Xtreme Gravity Racing rolls on! In the fall of 2015, Bodrodz Jason Camp and Doug Anderson with the Atomic Splinter headed to Pennsylvania for Fran Honeywell's East Coast Challenge. The Splinter would run SuperCar class with Anderson piloting. A class of three, Anderson would finish 2nd behind Donnie Schoettler from California and ahead of Andy Ash from the United Kingdom. The car did perform better than last year and more lessons learned. The summer of 2016 great news! "Fastdonnie" Schoettler of Huntington Beach, California would join the group and drive under the Bodrodz banner. The team was more than ecstatic to have this legendary gravity car pilot as a new team member. "Fast Donnie" would represent Bodrodz Xtreme Gravity Racing at the 2016 L'Ultime Descente, a world class gravity speed racing event held in Quebec, Canada. Schoettler would crush the existing Guinness world record held by UK's Guy Martin and would become the first gravity car to break thru the elusive 100 mph barrier while running under the Guinness rules! Fastdonnie with his triple digit run would also become the 2nd member to join the WGSA Century Club! This exclusive club consisted of individuals who had been officially clocked over 100 mph in wheeled gravity speed racing history. Anderson and Holsenback at the 2016 L'Ultime Descente would run respectable. Holsenback fought the ill handling Bullet to a WGSA 200 Limited world record and Anderson could only wring low 90's passes out of the Atomic Splinter. Respectable, but both wanted to go faster. Spring of 2017, Anderson, now realizing his two current road racing gravity cars were just punching to big of a hole in the air, knew it would take a new sleeker car build to go faster and punch thru the 100 mph barrier. Anderson would now design a gravity streamliner for the role. Bodrodz Fastdonnie had also purchased another GF1 car and was in the process of making major mods to it to up his record he had just set in 2016. Anderson and teammate Jason "the Chief" Camp would build thru the summer months the Bodrodz Atomic Scalpel, a top gravity streamliner. Holsenback would pilot the new streamliner. Halfway thru the summer, Anderson and Camp would start a second car for Anderson to drive and go after an open wheel gravity car record. The thrash was on. They knew it was going to be tight to make schedule and get both cars to the 2017 L'Ultime Descente hill on time. Tragedy strikes in late summer, Scott Holsenback is involved in an accident that leaves him with a serious eye injury and would not be able to pilot the new streamliner. Anderson would now fill the vacancy in the Scalpel cockpit and now BXGR was in need of a driver for the open wheeler, the Atomic Sliver. The first choice was obvious, Bodrodz UK teammate, Andy Ash. Andy jumped at the opportunity and the race was on. Both cars were literally finished up a day before Anderson and Camp would load the cars and head to Canada. The day before leaving a hurricane would come thru and blow out the lights. They would finish up the details and load the cars in the dark with light from flashlights and camping lanterns. Arriving at Baie-Saint Paul, the team was now thrashing, doing last minute prep and fitting the cars to the drivers the final day before the speed challenge. All three cars would go to the hill completely untested and the pilots with zero seat time. The hard work by the dedicated Bodrodz team would pay off. The three cars made 19 laps all together without a single mechanical issue. The 2017 L'Ultime Descente weekend would prove to be the best ever for the Bodrodz Xtreme Gravity Racing team. Three new WGSA world records, one run posted was the highest speed ever recorded for a wheeled gravity vehicle, and produced a new member into the WGSA Century Club. 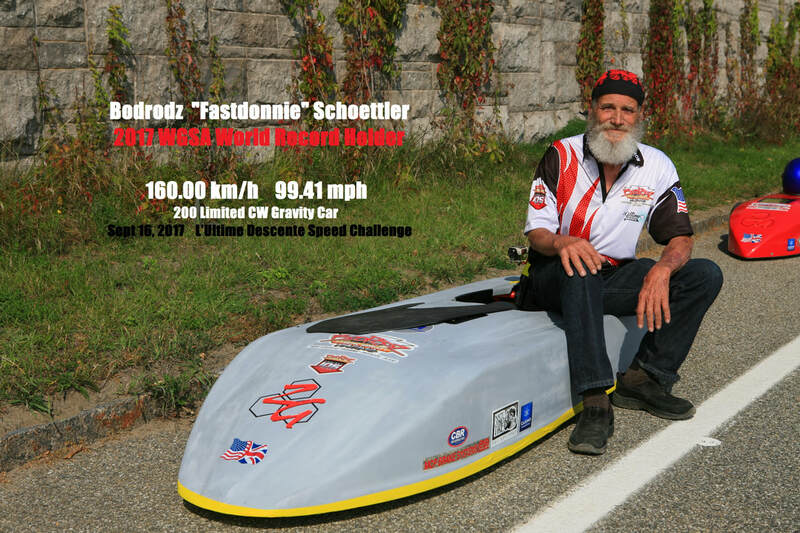 Andy Ash, driving the Bodrodz Atomic Sliver, would set the new WGSA 200 Limited OW gravity car record at 147.94 km/h 91.92 mph. Quite an accomplishment for never seeing the Sliver before let alone driving a car that had never rolled down a hill! Fast Donnie in his brand new car, the Grey Ghost, with zero seat time also, would reset his 2016 200 Limited CW record posting a speed of 160.00 km/h 99.41 mph for a new WGSA world record. Doug Anderson would be the first WGSA gravity car officially clocked over 100 mph! Anderson would pilot the Bodrodz Atomic Scalpel to a new WGSA top gravity streamliner record with a 164.13 km/h 101.98 mph pass! He would take top speed honors of this event and just became the pilot of the fastest wheeled gravity vehicle in history! Anderson would also become the 7th member to join the exclusive WGSA Century Club with his 100+ mph pass. It was a great race weekend for Team Bodrodz!